As you know, you can be faced with numerous obstacles when you’re trying to get your ex back. You’ve already tried many good techniques, but the one you still love hasn’t gotten any closer. Men often have a big ego, but the one you want to take you back has an especially inflated one. This is causing problems in your situation. Your goal is to reestablish a nice balance in your relationship, without being too needy or overly compliant, while rekindling the flame. In this article, we will explore all of this. When we are faced with a man with a difficult temperament, it’s important to know how to use and adapt certain strategies so that they prove to be the most useful to you. In this article I will teach you how to become more persuasive! Why doesn’t my ex want to come back to me? One of the biggest problems women often face after a breakup is a man that’s built himself a fortress of silence! The person you want to get back together with might not have the same mindset as you regarding the subject. For him, it’s over, he says he doesn’t have feelings for you anymore, and that you have to move on too. 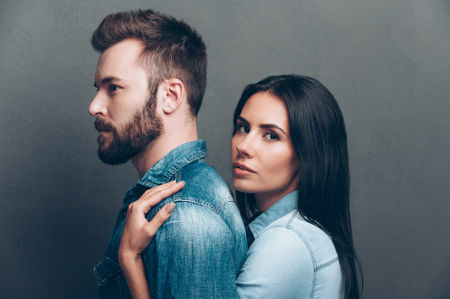 A man can be extremely prideful, and even if you didn’t see this side of him while you were still together, you’re suddenly faced with surprising behavior and attitude. He’s just made a big decision in leaving you, and maybe he’s only back because you’re asking him, and he doesn’t feel like he’s allowed to have his way. But maybe there’s another explanation. Perhaps you’re the one that left. You weren’t happy, you were having a personal issue, and your relationship wasn’t working out for you so you decided to separate. In this case, perhaps your man wants you to feel his pain. Of course each situation is unique, but through my experience with coaching, I’ve come to see that they share common themes. If you’re saying, “my ex is too proud”, the cause might be that you pushed him too far and you ended up hurting him. I’m talking about infidelity. If you cheated on him, don’t consider his pride to be inappropriate. However, it is possible to change the course of action, and to not have to turn the page like he wants you to. My ex is too proud to come back, but I’ll try anything! Sometimes a woman sees their ex, the proud man that she loved just the way he was, and thinks that making him want to take her back will be impossible, given his temperament. People often blow things a little bit out of proportion without realizing it. You think he’s an inaccessible man, and you think he’s angry or that he resents you simply because he’s not making any efforts to come back to you. You have to understand that after a separation, feelings aren’t enough, and pride isn’t always the only reason as to why your relationship hasn’t already been mended. There are a wide variety of explanations. Just because your ex needs space, and the distance between you is growing, it doesn’t mean that your ex will be closed off to discussions. In any case, you need to respect their wishes as well as certain rules. By begging him to come back every day, asking him about his feelings each time you speak, trying to find out if he’s in a new relationship or not, all you’re going to do is push him away and make him have less desire to be close to you again. Don’t forget that this is the basic rule for getting back together, so that he will be happy by your side. If you suffocate him, he’ll want to run away. The problem isn’t always the ex’s ego. Sometimes the problem is stemming from actions that you’ve already set into motion; actions that aren’t properly adapted to your specific situation, or worse yet, actions that border the “don’ts” of getting back your ex. We can design a proper, effective plan of action in a one on one coaching session. I know that when you’re in the middle of the storm, you’re hurting and your emotions seem uncontrollable; it’s hard to see the entire situation clearly, so this is why a meeting with an expert on matters of the heart is so important. Not only will you be able to benefit from my professional experience, but you’ll also be able to set into motion a precise, evolving strategy. Don’t hesitate to explore the toolbar to the top right of this page to learn more about specific guidance. How can I get a reaction out of a man with too much pride, after a breakup? Don’t wait for him to grovel at your feet after a separation! It’s important to specify this before you do something regrettable and are disappointed in your ex’s reaction. Not only does he have a lot of pride, which makes it highly unlikely that he’s going to come begging for forgiveness, but deep down, this isn’t how you want it to happen. You know that if he does this, it’s just a sign of emotional dependence and you know that it’ll result in an unstable relationship. If communication is preventing you from moving forward, if he won’t stop criticizing you, you’ll have to thicken your skin and stand tall until your ex comes to realize that his behavior is unacceptable. The best thing to do is to not make any brash actions when faced with a cold, irritated, or tormented ex, and to take action when the time is right. Under these circumstances, you have a tendency to worry too much, to become too needy or compliant so that your ex will be open to your improvements. You should never feel down about yourself because of a man, even if you love him, or else you’ll never be truly happy and after a while you’ll begin to resent him. Of course you can make efforts to bring about change, but don’t carry the entire weight of the relationship on your shoulders. To make him respond positively, don’t underestimate the importance of giving him space, and take the time to work on yourself as well. You don’t necessarily have to wait for him to make the first move, but fight off the depression that you are feeling. In this article, I explain how to deal with heartache in your relationship.